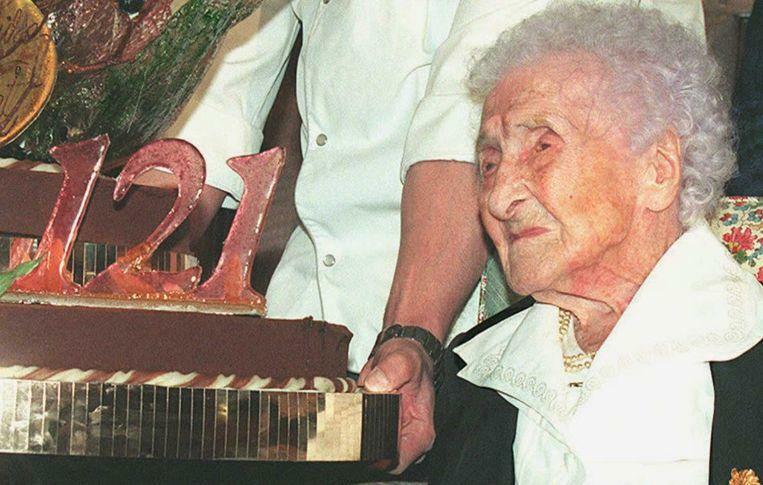 © AFP - Jeanne Calment at the party for her 121st birthday. Or maybe her 98th. 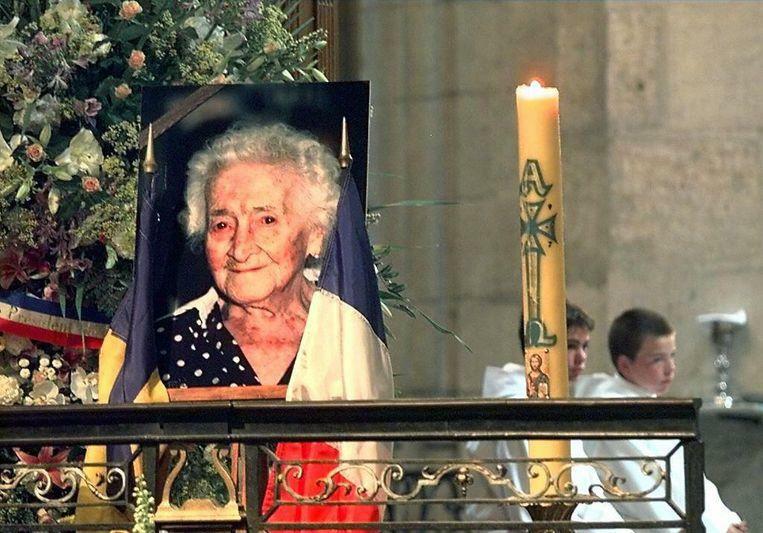 The Frenchwoman Jeanne Louise Calment – who died when she was 122 – is in all history books as ‘the oldest woman ever’. But that turns out to be a lie, Russian researchers say. She is world famous, she is ‘the oldest woman ever’, they called her ‘the grandmother of everyone’, and she still met Vincent van Gogh in person: “He was ugly and rude,” she said about the painter. 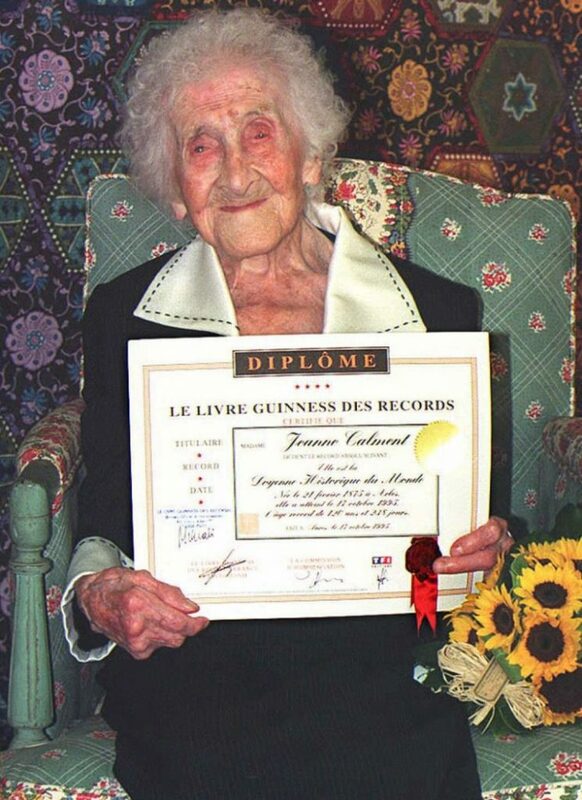 ©AFP – Jeanne Calment poses in 1995 with a certificate from the Guinness Book of Records. But the legendary Jeanne Calment turns out not to be so legendary now. A Russian researcher states that she was not the oldest woman in the world. Because Jeanne Calment, who died in 1997 at the age of 122, does not seem to be Jeanne Calment at all. It was her daughter who died then, ‘only’ 99 years old: she had secretly taken over the identity of her mother about 60 years earlier. “From interviews, biographies, photographs and documents all contradictions arise about her life”, says Nikolay Zak. He works at the Mathematical Center in Moscow (MCCME). Zak develops a mathematical model to learn more about long-lived people, and found that research on the life of the French. 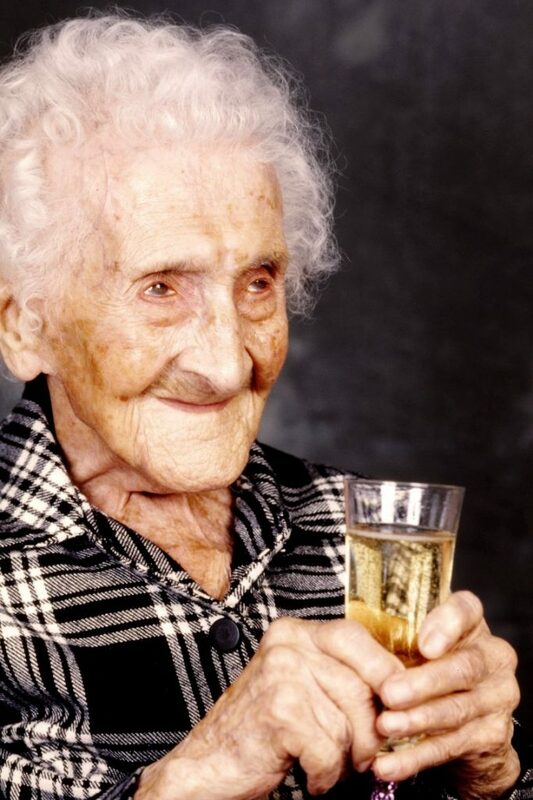 Jeanne Calment – the real one – was born in 1875 in Arles in southern France. She married, had a son and a daughter and was sporty: she skated, but also liked to go with her husband when she started hunting. Nicolay Zak investigated and discovered that there were even more loose ends. Calment once spoke about her father’s store – but she did not have a store. After her move to the nursing home, she destroyed photos and family archives. “It seemed like she had something to hide.” Outward features in her passport, such as height and eye colour, did not match her real appearance. In conversations, she mixed up her grandma and her mother, as did her husband and her father. The Russian gerontologist Valery Novoselov showed people a photo of the 117-year-old Jeanne and let them guess to her age. The most was said: 95 years. That was 22 years younger than the ‘official’ age of Jeanne, but the exact age of her daughter Yvonne at that time. That daughter Yvonne died, according to official documents, in 1934. Yvonne’s son was then – according to documents and testimonies – taken care of and raised by ‘grandma’ Jeanne. But the boy called his grandmother ‘mommy’ remarkably enough. There would be a financial reason for this change of form. Jeanne left a considerable legacy, but a huge tax had to be paid. Yvonne did not want to pay that and therefore let her mother ‘live on’, says Zak. Relatives of Jeanne Calment did not want to respond to the new allegations of the Russian researcher Zak. The specialists are now being called upon to dig up the remains of ‘the grandmother of everyone’ and of her daughter. New research must then definitively make clear whether Jeanne is really the oldest, or that Yvonne was cheating.